Death Valley is huge! It is one of my favorite destinations, offering stark beauty at elevations from below sea level at Badwater Basin through an elevation of 8000 feet at Mahogany Flat, or even higher were you to hike to the top of Telescope Peak. There are natural wonders and ghost towns, wide open vistas and narrow canyons, highways and back roads to explore. The park is enormous, and that is a problem for most visitors. Most people coming to the park come for only a few days, without realizing the distances involved. They end up visiting only a few locations concentrated around the sites offering lodging and meals, Badwater, the Mesquite Flat Dunes, Harmony Borax Works, and maybe a side trip to Zabriskie Point. There is so much more to take in. I had an aunt who liked to 'travel' by studying maps. She would spend time studying the map, learning about the area, thinking about what she might do if she could visit. I think that there must be many others who enjoy the same kind of travel to places that are difficult for them to reach. We now have a much nicer option available than dealing with piles of paper maps to fold, crease and tear. We have at our fingertips online maps with satellite imagery whose resolution we can control with a click. 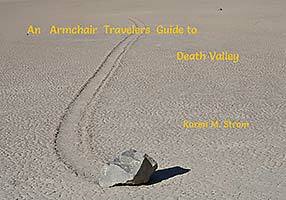 In this guide you can peruse panoramic views of many of the features in Death Valley, some visited by many and others by only the most determined. These panoramas are viewed through the windows of real and imagined buildings in and around the park.